Light pollution is a relatively new term coined to describe light that trespasses. To see light pollution from your nearest town, a person just needs to look to the horizon at night from the countryside. The halo of light on the horizon, better known as sky glow, is the result of excessive use of lighting. Scientists estimate that about 100 million birds across the US are killed every year by crashing into windows or die from exhaustion after becoming confused while trying to navigate by artificial lights instead of the stars. From insects to amphibians, from plants to invertebrates, studies now indicate a possible negative effects light pollution has on our ecosystem. Studies now show possible links between artificial lighting and negative effects on humans. Recent studies linking artificial lighting and certain forms of cancer is just one possible negative effect of light pollution. Lost are the night skies of yesteryear when children looked to the heavens pondering life's many mysteries while camping in the backyard. From major cities to minor towns, all but the brightest stars are now no where to be seen, enveloped by the glow of misdirected light. JUST HOW BAD IS INDIANA GETTING? 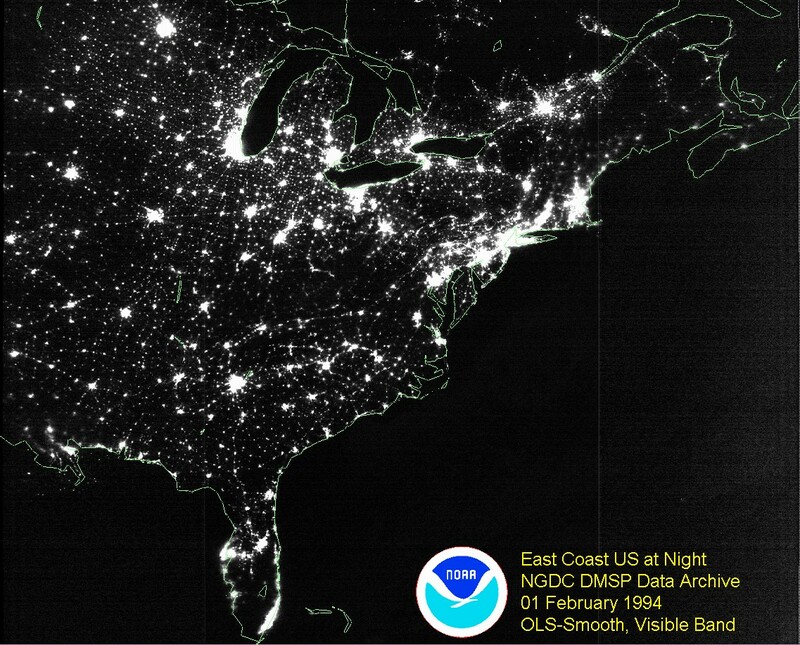 Above left: Credit: Steve Albers light pollution model based upon the 1990 census (http://laps.fsl.noaa.gov/albers/slides/ast/places.html). Above right: Credit: P. Cinzano, F. Falchi (University of Padova), C. D. Elvidge (NOAA National Geophysical Data Center, Boulder). Copyright Royal Astronomical Society. Reproduced from the Monthly Notices of the RAS by permission of Blackwell Science http://www.lightpollution.it/dmsp/. note: Both images superimposed on Indiana county map by Forrest Hamilton. Needless to say, Indiana has no class 1, 2, or 3 skies left. 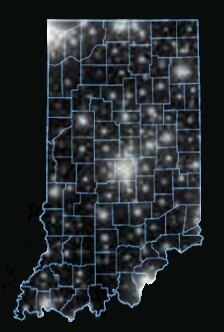 The darkest contour in Indiana is the green one, which corresponds to class 4 skies. "Satellite images dramatically reveal that for most people the sky never becomes truly dark and that, sadly, the starry, starry night has become a thing of the past. Two-thirds of Americans and Europeans can no longer discern our own galaxy, the Milky Way, with the naked eye. That's because of almost a third of the light used outdoors escapes upward, totally wasted, into the night sky. About 2,500 individual stars should be visible to the human eye in an unpolluted night sky. But in a typical suburb only 200 to 300 stars are visible, and in a city fewer than a dozen stars may shine through the ever-present skyglow. The IDA (International Dark-Sky Association) estimates that each year in the United States, more than $1 billion is spent to generate that wasted light - resulting in the needless burning of some 6,000,000 tons of coal annually." Billions of watts of wasted electricity stream continually into space as light from cities and towns in eastern North America. Although light pollution can never be completely eliminated, better commercial and municipal lighting practices could reduce it significantly. This 1994 satellite image is from the Defense Meteorological Satellite Program. Courtesy NOAA and the U.S. Air Force. JUST HOW BAD CAN THE UNITED STATES GET? Above: Credit: P. Cinzano, et. al.